Very limited in quantities. The supply is minimum. The supplier had to wait for them to fall from the sky and get accumulated over time. Tektite is not a crystal or stone that grows on earth. Instead it is a stone genuinely fallen from the sky through outer space, being the reason why it is the only stone genuinely believed to be fallen from the heaven. A tektite is actually a meteorite that falls onto earth, only found in Tibet, Australia and USA. 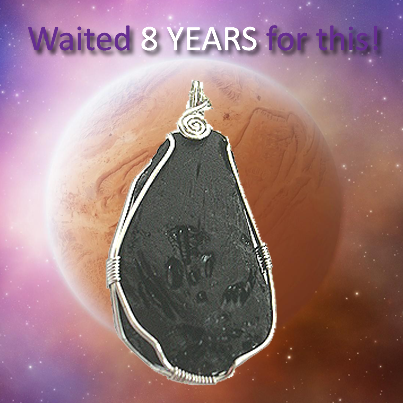 The Tibetan tektite is the most powerful. Some scientists believe they belong to material found in the moon due to geochemical evidences. The ones we sell are from Tibet, unprocessed and still in its original form and in aerodynamic shapes such as spheres, tear-drops, dumb-bells, and disks where they are still well-preserved. We encase them in special settings of copper with platinum silver plated wires to ensure they look naturally beautiful, fashionable and cool-looking suitable for both the young and matured adults. Because it is a meteor, it has powerful energies and has the ability to strengthen the energy field within us and in our surrounding. It is best to benefit those who desire to balance and activate the whole chakra system for all-rounders luck. It is known to have the best effect to ward off evil spirits and bad luck. Its black color best represents "water element", therefore benefits wealth and career luck! International community irrespective of religion, culture and background believe that tektite meteorites, similar to dzi beads brings all kinds of good fortune, divine protection, good health, wealth, prosperity from heaven, victory over foes, windfall luck and ultimate good luck. It enables the wearer to gain power and influence. It can also protect the wearer against all kinds of misfortune, including falling prey to spirit harms. From those who believe in "crystal healing", the tektite meteorite produces powerful energies to encourage accumulation of knowledge and eases insight and comprehension. It will also ease problems connected to the nervous system and therefore is very suitable to assist those who are often emotional, nervous, fearful, under stress, anxious, pressured and angered. Note: The pendants come in different forms and sizes naturally and therefore encased in different shapes uniquely. It comes with a free necklace.